Klockit is a family-owned business located in Lake Geneva, Wisconsin. 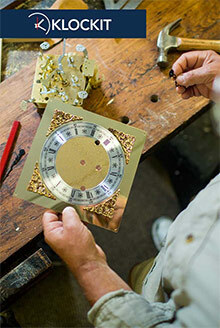 For over 43 years we�ve been committed to offering quality products at competitive pricing, and supplying you with everything needed to build a beautiful heirloom quality clock or to repair a treasured keepsake. Enter source code - CDC10 - at checkout on the Klockit website. Klockit clock parts suppliers - If you've always had a passion for clock making, but never knew how to get started, the Klockit clock catalog is exactly what you need to help figure out how things tick. Klockit clock parts suppliers proudly display a wide variety of clock repair parts, clock kits, clock plans and components, from Quartz movements to clock inserts, hour and minute hands, clock dials, pendulums, mechanical movements and so much more. Clock repair parts - The Klockit catalog features all of the elements that are vital in repairing and/or restoring your favorite timepieces. From hard to find clock movements to clock hands, pendulums and clock movement accessories, you'll find the essential clock repair parts that you need to keep your treasured clocks in the family. Klockit clock parts suppliers also provide the clock repair tools you need to get the job done, all in good time. Clock kits and clock plans - Why buy a clock that's already assembled when you can build your own clock masterpiece from scratch? Indulge an old hobby or start a new one with Klockit, where you can build your own timekeeping device from a wide selection of clock kits and clock plans in a series of designs. Choose from wall, mantel or grandfather clock kits and clock plans that include easy step by step illustrated and written instructions. Pre-assembled clocks and clock gifts - Whether you're a fan of grand-sized grandfather clocks, classic table clocks or charming themed cuckoo clocks, the Klockit catalog offers a selection that will not disappoint. Choose from elegant and traditional Hentschel and Howard Miller grandfather clocks, a wide range of Atomic clocks and watches, desk and wall clocks and other handcrafted timekeepers that will make exceptional gifts for any clock lover. Clock inserts - No matter what size clock inserts you need, trust Klockit's clock parts suppliers to have them in stock. From mini clock inserts that measure under an inch to 4 inch+ inserts for larger clocks, you'll be covered with the right parts, around the clock.